For being someone who blogs about technology I have a confession to make – I have never owned a cell phone. I know this is incredibly strange and does not make sense but it is the honest truth. It just never seemed necessary to be able to be contacted at any time by any person so I just never wanted to fork out the money to get one. However, the steady prodding of my wife, the fact that I have this blog about GPS tracking, and the super cool Android cell phones that are coming out have all pushed me towards a decision to get into the market. Now that I am pretty certain that I am going to get a phone I had a decision to make – do I just get any old phone or do I go big and bold and get some top of the line cell phone. Being the type of guy that I am I had to go with the biggest, best phone that I could find. If I am going to cave and a mobile phone I might as well get something that is going to be both fun and useful. Naturally, it would have to be a cell phone with GPS so that I could use it test out cool and fun GPS tracking programs on it as well as have some pretty sweet features that could be interesting to use in a whole host of other applications. A good camera would be nice. The same holds true for a super fast processor. However, the absolute must is going to have to be the ability to work all over the country. The immediate front runners for my phone of choice are the iPhone, the HTC Incredible, and the Droid X. I am sure that there are some other phones that fit the above criteria on other networks like Sprint or T-Mobile, but Verizon and AT&T are really the only ones I am considering. Verizon has the lead because my wife is already on that network, but AT&T is also a consideration because they are the only one with currently carry an iPhone. 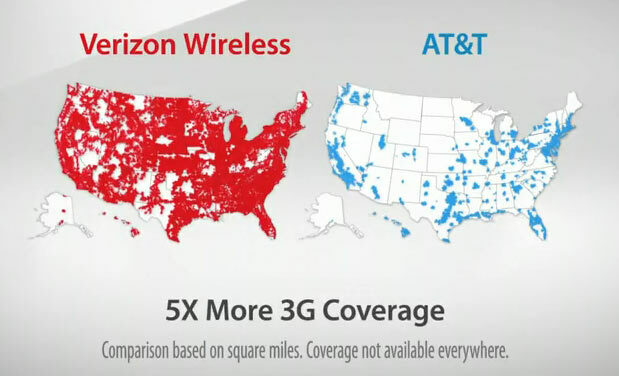 I think when it comes down to it, Verizon beats AT&T in this department – at least from an advertising perspective. Add to this the fact that I have not heard one good thing about AT&Ts service from anyone I know and you have a clear case for Verizon in the carrier department. Now that I’ve talked about the carrier situation a little I should turn my attention to the actual devices I am thinking of making my phone. The most obvious distinction between the two are that one runs an Apple OS and the other two run the Android OS. I have to be honest again, I don’t know jack squat about operating systems. I am not a technonerd. I just like things to run fast and run smoothly. Besides that I don’t care. And as far as I know both OSs work great. But there is something that I kind of do think is important that separates the two sides: one is open source while the other is proprietary. To me, this is a huge deal. Giving users the ability to create programs for the phone that can increase its functionality and improve user experience for free is a huge benefit in my opinion. To me, this makes the Android OS better. The HTC Incredible has been out for a few months now and is looking to be a very solid cell phone. It definitely has some GPS features built in to it so it can be used for my GPS tracking tests if I were to get it. It is also a fast phone with a 1 GHz processor which means that it is already a better computer than my first desktop that my family owned 10+ years ago. With 8 GB of physical memory it also vast outshines that old machine that ushered me into the computer age. The phone is also appealing to the eye – or at least so say I – and it looks like it has a host of other features for those who like to look at things. The 3.7″ screen is a decent size and seems large enough to view webpages and such with ease. I also like the 8 Megapixel camera that it sports and think that being able to take pictures at night is a plus – yay for flash! From what I can tell, it looks like the HTC Incredible looks like it should run for 5 hours under constant use, 146 hours in standby mode. I also think HTC has some cool things included in it like their social networking mashup program or something. It makes my wife excited about the phone. For me, it doesn’t really matter. Overall, it looks like a great phone worthy of my consideration. Compared to the HTC Incredible, the Droid X is pretty much the same phone in the sense that you are going to be getting the Android OS on Verizon. It also sports an 8 Megapixel camera with night flash. It has a 1 GHz processor two, but of a different variety (I think). In general, you are going to be getting the same phone with the same features, just different. The main difference is that the screen is going to be bigger on the Droid X. It comes in at 4.3″. It also is going to let you shoot video in 720p, which isn’t too bad. It’s not 1080p, but it definitely is better than the standard 480p that comes through your TV. Another difference is that the Droid X comes with 24 GB of memory out of the box, which is probably more than I will ever use. I guess I should also note that both the Droid X and the the HTC Incredible come with Google Latitude and Google Maps Navigation standard. The former is a free GPS tracking application for cell phones and the later is a free navigation application for cell phones. Both rock. Let’s be honest here, the iPhone is definitely outside of my demographic when it comes to the marketing campaigns. But that is neither here nor there. The iPhone 4 is a serious phone with a host of things to offer its user. Built in GPS, a video phone feature, tons of apps, a slick design and intuitive operation – some think that the iPhone has it all. The phone definitely seems fun to have, but I don’t think its for me. Its just too cool to have an iPhone and I am not very cool. Sorry Apple. I think that when it comes down to it I am going to be getting the Droid X. But I think I am going to cheat and actually get both the Droid X and the HTC Incredible. The former is going to be for me. The later for my wife. That way I can test the GPS tracking applications for each phone. It will also help use test things out and see exactly what our Android GPS cell phones can actually do. If you have any questions or things you would love to see us take a look at with the phones just leave a comment below and we will be sure to get around to testing it out for you. It might take us a few weeks/months to get both phones since they are nowhere to be found – but once we get them we will let you know everything we find out. We also written a post where we talk about some different free GPS cell phone trackers where we include certain ones for the Android OS.